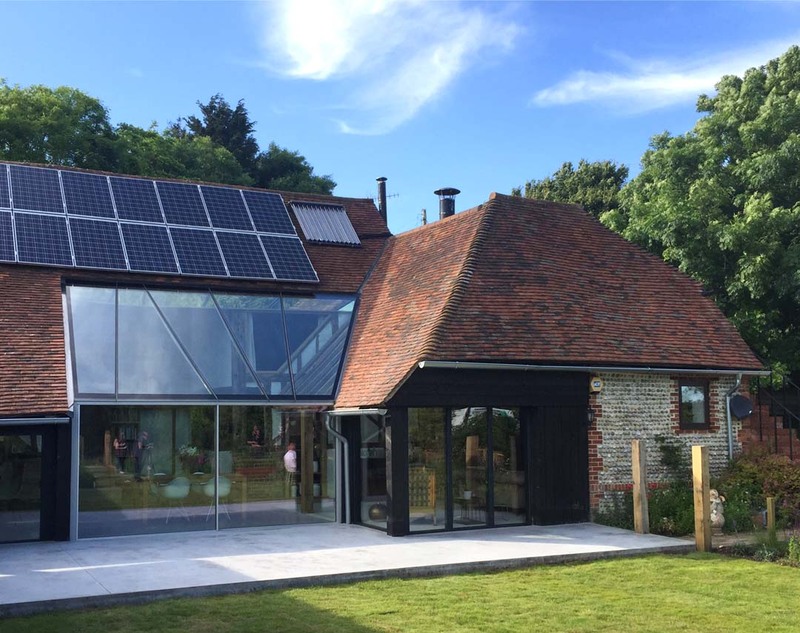 The clients wished to fill their medieval barn with natural light while enclosing the courtyard into the building, increasing the living space and allowing free movement from three separate areas into a huge open zone. The chosen option has irregularly angled mullions and non-rectangular panes. As well as adding visual interest and texture it also disguises the ‘security bar’ effect found on standard shaped installations. The design’s complexity was compounded by the varying pitch of the adjacent roofs, leaving only two of the installation’s twenty angles at ninety degrees. The architect chose blade-like polished stainless steel frames, tapering to enhance the sense of floating glass on the surrounding structure. meia carefully fitted the rooflight frame around the original wooden beams of the building. As a result, the structural timbers left exposed allowed sight of the ancient history of the house’s skeleton. The stainless frame for the glazing was initially positioned just above the existing timber structure with a jig. Once aligned, each support connection was hand crafted to spread the weight evenly on the old and warped timbers. Likewise, every gutter and spout detail was cut and welded on site. Hence, the neatest possible fully waterproof junction between the glass framing and the adjoining tiles was allowed. The eave support structure was carefully designed in conjunction with architect, suppliers and the main contractor, giving minimal visual appearance whilst providing structure for proprietary sliding doors to be fitted beneath. This project was featured in a July 2016 episode of Inside Out homes on Channel 4.